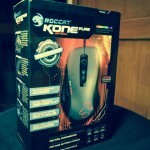 Even before taking the mouse from the box, I just had this feeling that this product had something special about it. I mean if you just take a look at the box you’ll immediately notice that a lot of work has gone in to that box. The box, other than being very good looking, also boasts of the various features that the mouse has and at the back of the box its said in about 8 languages. 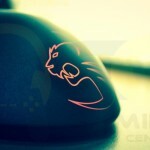 There is even an embossed logo for the 2D Titan wheel that this mouse has. 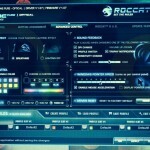 The folks over at Roccat try extremely hard in manufacturing peripheral devices for PC. From the pictures and video you can see that the box actually opens up to showcase the look and feel of the Kone Pure Optical. The mouse is covered in a plastic casing, but the case is cut out in the shape of the mouse, therefore you can get not just a look but a pretty good feel of the mouse. 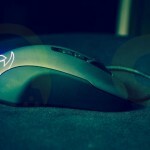 This I found to be a very good aspect as there are many gaming mice that aren’t showcased in this manner and forces you to make a decision based on reviews etc. And it only makes sense to do so, I mean you don’t want to spend 5 grand on a mouse and then later find out that it actually is smaller than you’d imagined it to be. As far as content and package specifications are concerned, the Kone Pure Optical comes with a quick installation guide which shows you a outline of the default button assignment and the link from where you can download your software, along with various other instructions. 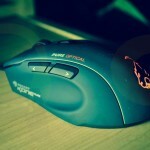 Lets take a look at this mouse before the indepth review. 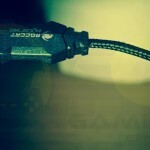 The braided wires offer long hours of gaming. 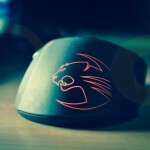 Compared to Roccat’s Kone XTD, the Kone Pure Optical is 9% smaller in size. This for me is a good thing, cause now the curvature and proportions are perfect for the claw style of grip and maneuvering. 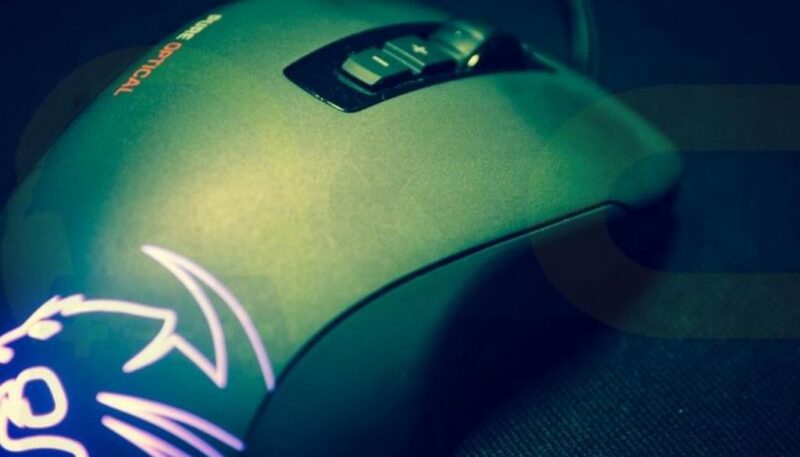 The mouse itself is fairly sleek with a dual-shade color scheme, with the sides being a mat black finish and the top of the mouse having a grey shade to it. The Kone Pure Optical is specifically made for right-handed users. The soft-touch feel of the exterior adds to the overall feel and comfort. 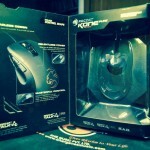 The button placements are similar to most other gaming mice in the market. 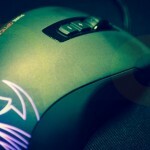 Two thumb buttons are placed on the left side of the mouse, with one of them dedicated to the “Easy-Shift [+] functionality. 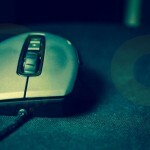 The top of the mouse consists of the scroll wheel and right beneath it lies the two buttons of DPI adjustment. The Titan wheel is quite sturdy and has a good rubbery grip on it which helps in accuracy. 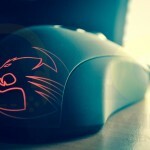 The thing that grabs your attention almost instantly is the translucent Roccat logo that lights up when you plug the mouse into the computer via USB. 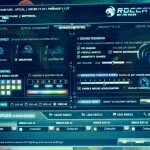 Not only does this mouse feature the “breathe” option but you can do all this with 16.8 million colors. 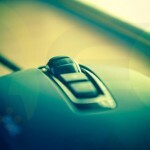 Under the mouse are two rubberized feet placed around the optical sensor. One thing I sorta liked was that this sensor didn’t omit and red light which is very common these days. The cable is pretty long and is braided. Even the USB connector is not something that they just put it last minute–it looks like something straight out of Batman’s batcave. 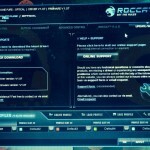 The drivers needed to operate the Kone Pure Optical can be obtained from Roccat’s official website. 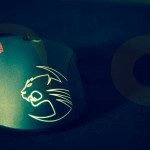 The mouse itself has (on-board memory) 576kB worth of memory, which is sufficient to store about 5 individual profiles. The user interface for the software is sooooo easy, I didn’t even need to look at my manual or guide. 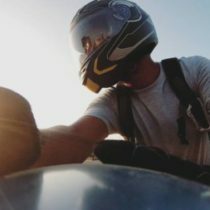 They have really simplified everything to the needs of a gamer, and for those who need more specifications or advanced settings have other sections for them. There are 5 tabs in total for the software–Main Control, Button Assignment, Advanced Control, R.A.D., Update/Support with each having its own various controls and customization options. – Pro-Optic (R3) Sensor : Designed to deliver ultra-precise and lag free gaming at 400, 800, 1600 and 4000 DPI. 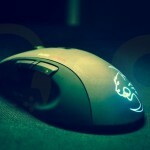 – Roccat Logo: You have about 16.8 million colours that you can choose from to light up the Roccat Logo on the Kone Pure Optical. Also features the “breathe” effect. 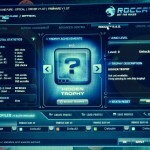 – Roccat Achievements Display: An exclusive Roccat feature that tracks and then accordingly rewards you with a wide range of gaming feats. 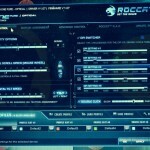 It complies your mouse use data and then hands out trophies when you reach exceptional milestones. The Kone Pure Optical is a product that is not only made to showcase but also to last. It competes with the best in the market today and needless to say is a high-quality product that is worth its Rs.5,000 price tag. 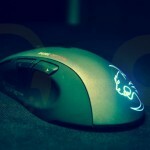 The customizable LED logo takes care of the aesthetic value of the product, while the feel and comfort of the mouse add to the overall experience. 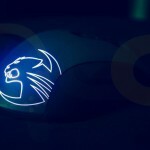 And to top that all, the feature-filled and friendly interface for the software and the Roccat TALK feature make it all the more easier for us to recommend this to any gamer.